2016 has been a pretty packed year for us at Hawthorne & Heaney, but one of the highlights has to be the Elle magazine cover we produced for their September issue. As one of 5 covers released we were delighted to be commissioned to produce this one for the project. The theme of the issue was Icons of Change, as we shared the honour of the cover with the likes of Zayn Malik and Kristen Stewart. Our cover was designed to be as subtle as possible, a blank canvas on which the main question could be asked; ‘Now what?’ as the issue marks a change in direction for Elle magazine. In house, it was a really exciting project for us as it gave us a rare opportunity to amalgamate hand and machine embroiderery techniques, unifying our departments. 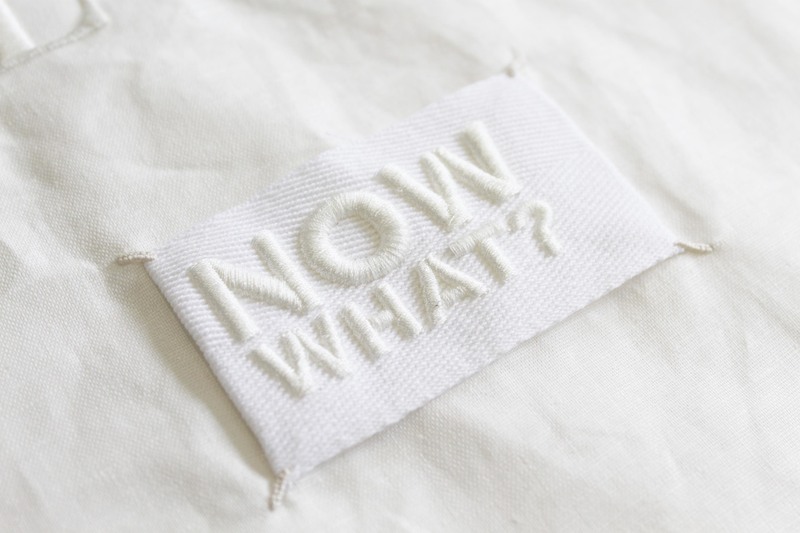 The main title and the label’s lettering were done by CAD machine embroidery in a light shine thread over raisings. 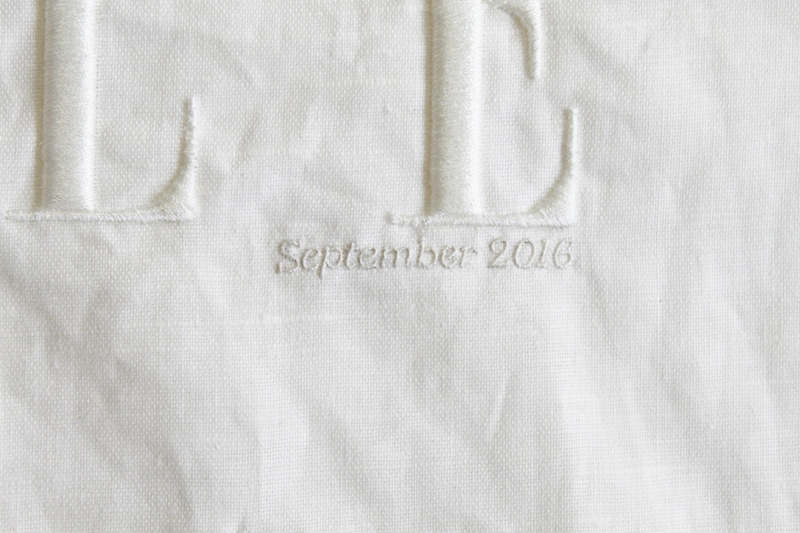 The finer details were added in hand embroidery which can be seen in ‘ElleUK.com’ and ‘September 2017’ as well as the stitches applying the label. This year we were lucky enough to work with a very promising CSM MA student called Andrew Totah. We produced a series of embroideries for him which feature in his final collection which are so vibrant and exciting, we couldn’t wait to share them with you. Andrew Totah’s collection is based on his travels through South Africa and features a wonderfully vibrant colour palette which reflects the culture. Andrew’s collection is very much about telling a story through his designs so his girls are superheroes of a kind who modify their clothes and empower themselves by take back control of their city in the night. 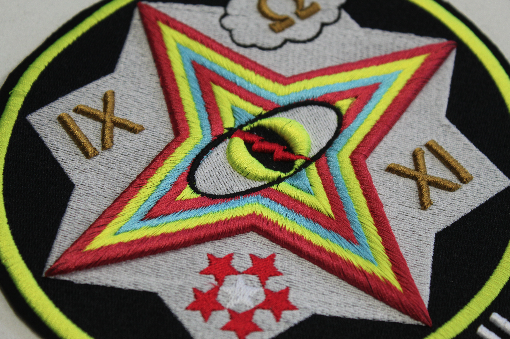 We produced a series of heavily machine embroidered patches to compliment his collection, all of which were his own graphic designs. Most of the embroideries are raised from the surface of the fabric, that combined with the punchiness of the colours makes a strong impression. To see more about the collection and the inspiration behind the designs, as well as the embroidery on the garments shown in the show at the end then have a watch of the video below.